It’s not just about experiencing an authentic safari adventure in the wild, but living it! We at Sri Lanka Big Game Safaris are true believers in providing thrilling wildlife experiences – and it doesn’t stop at safaris. Enjoy simple yet comfortable accommodation in tented camps at the borders of the Yala, Udawalawe and Wilpattu National Parks, for a closer-to-nature living experience. 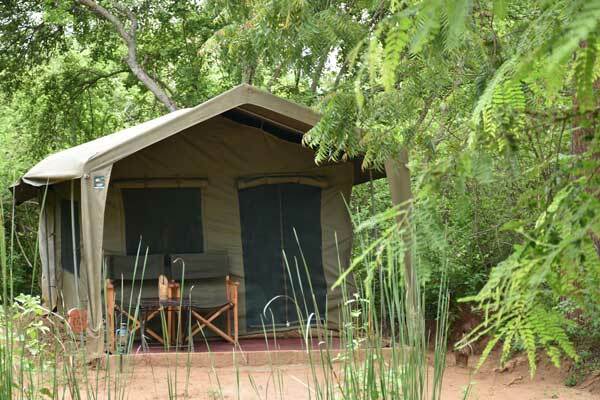 Our tents are fitted with a bedroom and an en suite bathroom with hot & cold water. The beds are raised and fitted with comfortable mattresses. Pillows, bed linen, towels, a flashlight, and basic bathroom amenities are provided. Additionally, umbrellas and raincoats are provided during rainy weather. Our experienced team is here to take care of your every need, as we take pride in providing personalised service while paying close attention to every detail. 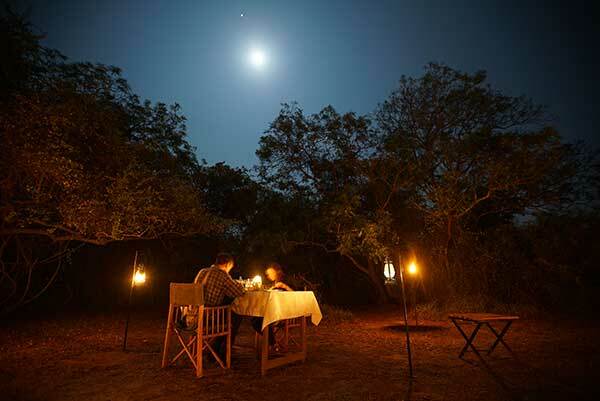 At sundown, after a rewarding safari, sit by a roaring campfire with a chilled beer while lighting is supplied by flame torches, hurricane lamps, and the moon. Nightfall brings new excitement; the thunder crack of ‘Elephant Crackers’ in the distance lit by farmers as a warning to elephants wandering too close to their harvest, an occasional hoot of an exotic owl, the soft purr of a jungle cat… you don’t quite realise you’re in the middle of an adventure until you live it! We provide exciting dining experiences, with professional chefs creating gourmet traditional and fusion cuisine. There is nothing quite like an alfresco dinner under the stars, or under the canopy of a large tree, with the ambiance of a bush forest hiding scurrying animals. Enjoy a BBQ by the campfire with the entertainment of tranquillity and chirping crickets, and, additionally, our assurance that you will experience more than just a meal. 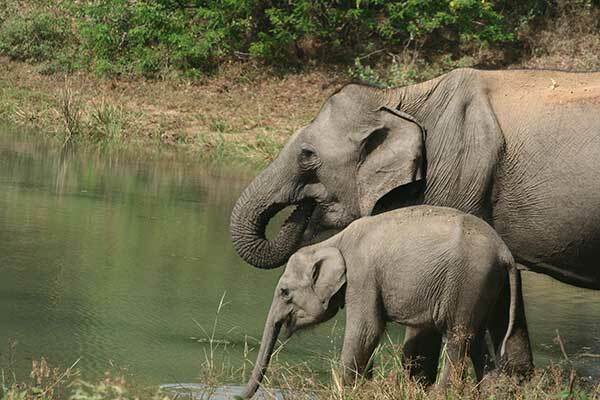 While Sri Lanka Big Game Safaris offer you the freedom to arrange your own Sri Lanka Wildlife Tour, we highly recommend booking wildlife tours with us, as we can ensure that your safari experience is up to the high standard you expect. 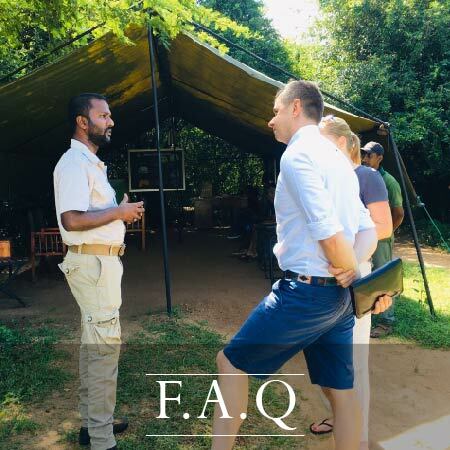 We have two Sri Lankan Safari Packages to choose from, and for an additional fee we can include an expert naturalist guide (subject to availability). You may select one of the following packages from us. The service was excellent, with real attention to detail. Wonderful breakfasts and evening BBQs. Tents were very clean and well-equipped. Campsite is very close to Yala National Park for Jeep Safari, which was great fun. Highly recommended for 2-night stay with kids.